Our specialty is adoption and we would like to see every couple fulfill their dream of becoming parents. What Is Private Adoption All About? Private adoption is a wonderful option for many people looking to start a family. We understand that most of our clientele have gone through years of infertility before they arrive at our doorstep. We understand your concerns and have been there ourselves. Most of our staff are adopting parents. We have been through the process. Private adoption has many advantages over agency adoptions. 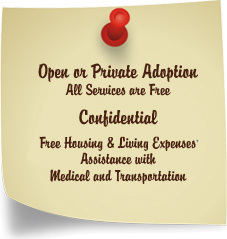 First, private adoptions are less expensive than agency adoptions. Agencies generally have a “flat rate” that cover their administrative costs and any additional fees such as birth mother, legal and caseworker fees are in addition to the “flat rate”. Private adoptions, however, are calculated individually based solely on the specific adoption situation you are matched with. Considerations such as at what point in the pregnancy you become involved are factored in. Most people are not aware that most of the newborns in the United States, particularly California, are adopted privately and the process is legal. In California, only a licensed adoption agency or the birth parent(s) of a child may place a child for adoption. Our staff works closely with birth mothers who have made the decision to place their infant for adoption. We work hand in hand with the birth mother to make the process as smooth as possible. Birth mothers find private adoption so appealing because it is more personal. At our office a birth mother is assigned a caseworker who sees her through the whole adoption process from start to finish. Our caseworkers are available to the birth mother 24 hours a day. The birth mother plays an active role in private adoption. She is the one who selects the prospective adopting parents. In addition, many birth parents wish to interact with the adopting parents while others wish to remain anonymous. Each case is different. 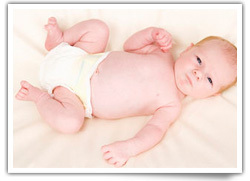 As the adopting parent(s) you will be given background information on the birth mother. A complete health record and general information sheet on her lifestyle, hobbies, social history and educational background is made available to you. Whenever possible, you will have information on the birth father as well. Our adoption service is two-fold. We work with prospective adopting parents and aid them in their search for an infant. We also work with directly with young women wishing to place their child for adoption. The first step in the process is to contact our office at (909) 989-2750 and have an information packet sent to you. Once you send that back to us we will call you to set up a consultation. If you are an out-of-state client, we arrange a phone consultation with Attorney George Maricic. The consultation takes approximately 1-2 hours. During the consultation the attorney discusses in detail about private adoption, the legal aspects and take you step by step through the entire adoption process. California’s laws on private placements are constantly changing and Mr. Maricic will discuss how those changes may affect you. We will discuss how to get a homestudy, how to set up a profile and how to be proactive in making sure you are seen by prospective birth parents. The current status of laws regarding birth fathers and their roles in the adoption process will also be addressed.